Powered by a brand new 50hp Nanni N450 diesel engine. 220v from a 4Kva Kohler generator. Known for innovative design and quality construction the Nicols yard is one of the most prolific constructers of inland waterway craft in France both for the hire and private markets. Not to confuse quantity with quality they have a vertically integrated production philosophy and maintain quality control at the production stage not just the assembly stage. This 1350 VIP left the yard in 2003 destined for the luxury hire market and has just undergone a major refit by Nicols, with new zero hour Nanni engine, new upholstery and new kitchen. Space, light, comfort. The “owners version” of a boat designed for ten people on holiday hire transformed to accommodate just two double cabins, each with 1.95m x 1.4m walk-a-round beds and en-suite showers and separate toilettes. Fore and aft are heated and cooled separately with independent heating and air-conditioning systems. The deck lounge has an inside steering position and a spacious practical galley with double sink 220litre fridge and flu cooker. A dining table opposite for convivial entertaining. Outside, three separate deck areas. The fly is ideal for sunbathing the aft deck for entertaining and the foredeck seating with table is ideal for intimate dining or those solitary moments with a good book. 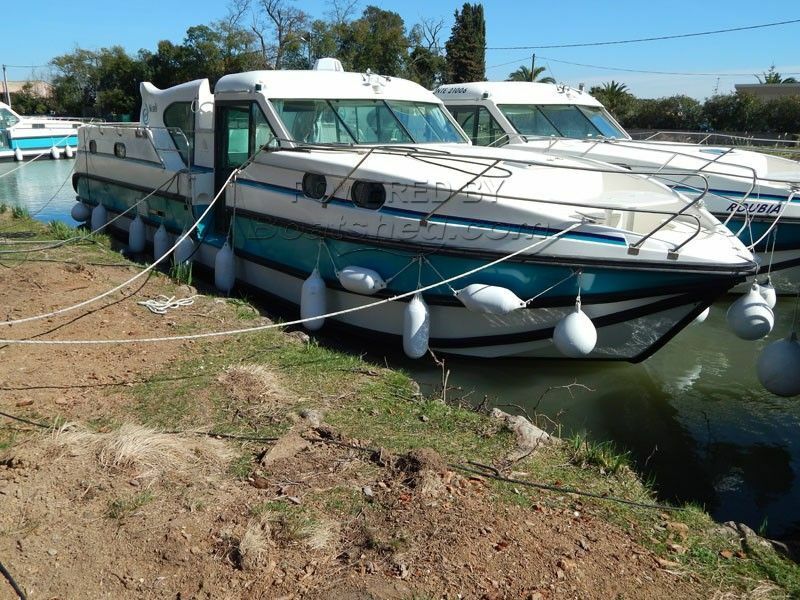 Canal and river cruiser for sale by Boatshed Midi Canals. We are pleased to offer this Nicols 1350 VIP for sale. The Nicols 1350 is a hire boat designed for 10. The Nicols 1350 VIP is a two cabin owners version with space, light and comfort for a couple and their guests. Nicols are renowned for combining innovative design and quality construction and their distinctive motor cruisers are a familiar site throughout Europe’s waterways. This boat is for sale with new upholstery, a new galley, a new engine and a saving of 200,000€ on new price. For further information and appointments to view, please contact Graham WHARMBY your broker at Boatshed Midi Canals. This Nicols 1300 VIP Owner Version has been personally photographed and viewed by Graham WHARMBY of Boatshed Midi Canals. Click here for contact details.